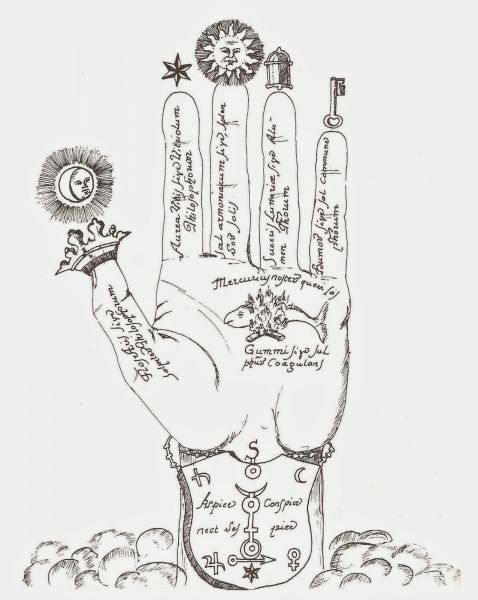 The emblem of the hand of the philosophers' should be quite familiar as it is often used in modern books on alchemy. This was originally an illustration in Isaac Holland's book Die Hand der Philosophen. The writings of Holland, who cannot yet be unidentified with a definite historical person, appeared at the end of the 16th century, and were revived in the mid 17th century and reprinted a number of times up to the end of the 18th century. The images placed on the hand are evocative, and it is tempting for people to interpret these through their present day belief systems, however, the author has left us a clear statement of their meaning. This is from his book Die Hand, of 1667. Below I show, on the left, the engraving from 1667 and, on the right, that from the 1743 version of the work. Those who have not this Hand and do not understand its secret signs... they do not possess the philosophers' treasure. Thumb. First look at the thumb on which a crown stands below the quarter moon. By this is meant saltpetre. For just as the thumb vigorously finishes off the hand, saltpetre does in the alchemical art, for he is the King and Lord of all salts. He is the mill through which everything must be ground. Index finger. The second sign and secret of the philosophers is the star with six points, standing above the forefinger next to the thumb. It is compared to Roman Vitriol, because no work that is to be perfect can be completed without vitriol, for it is the greatest and strongest salt after saltpetre. Middle finger. The third sign is the Sun standing above the middle finger. By it, Sal ammoniac is designated, for, apart from saltpetre and vitriol, nothing more powerful is found. Ring finger. 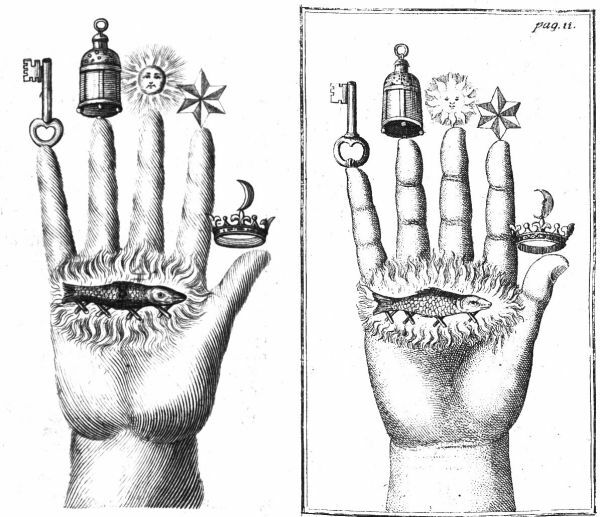 The fourth sign of the philosophers is the lantern standing above the fourth finger of the Hand, whereby alum is indicated. For without alum, no perfect work can be accomplished, because it is required for the red and the white. It has an astonishing nature and a most subtle spirit. Little finger. The fifth secret and sign is the key of the philosophers, standing above the little finger. Simultaneously, it is the lock of the Hand. That is why the key is standing on it. By it, common salt is designated, for salt is the key in this art. Middle of the hand. The sixth secret sign is the fish. It stands in the middle of the Hand and signifies Mercury, for without Mercury or the fish nothing can be done. He is the beginning, the middle and the end, and he is the priest who must marry everything. He is the male and the seed; he is the water out of which all metals have originated; and he is the principal factor of all arts, and the greatest of all secrets. Palm. The seventh sign of the philosophers is fire. By this Sulphur is indicated. It is the earth and beginning of all metals. It is the female who brings forth the fruit. For no seed can grow unless it be first thrown into fertile soil. Then beautiful fruit will come from it. Thus it also happens that when a pure Mercury is joined to a pure Sulphur, this brings forth pure fruit. Thus, they are man and woman, father and mother, fire and water, seed and earth. In 1647 the book Hermetischer Probier Stein (The hermetic touchstone or tested stone) was published at Franckfurt. It drew on the work of alchemist and professor of chemistry at Marburg, Oswald Croll (c. 1563 - 1609). It included short section 'Hermetischer Wunderbaum' (hermetic miracle tree) a series of engravings based on the Hand of the Philosophers. 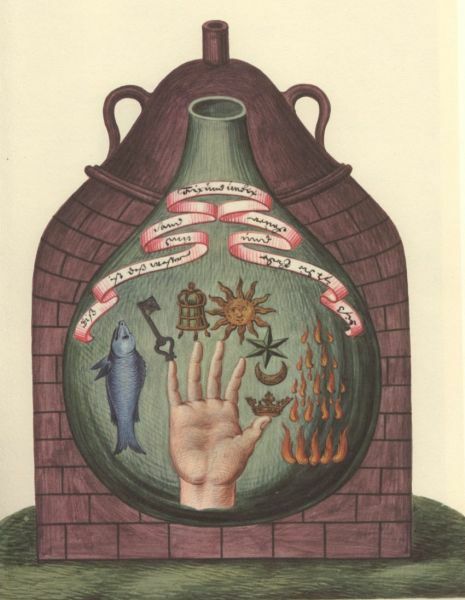 Here the creator of these emblems takes the Isaac Holland idea somewhat further by placing the hand with its symbols into a flask and distilling it. 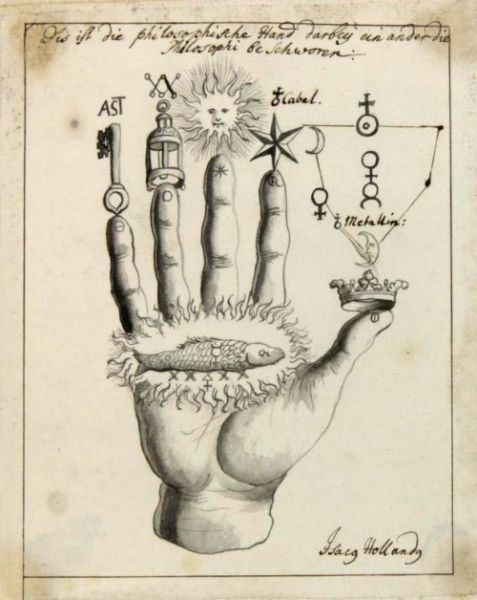 Here is another variation of the alchemical hand. Here the fingers bear the conventional symbols of the relevant substances. This also has an interesting diagram of symbols, set above the Moon, forming a little pentagon, though rather irregular in shape. Another version of 'La main alchimique', this time mirror reversed, is found as a pen drawing in the 17th century MS. 3020 (169 S.A.F.) in the Bibliotheque Nationale in Paris, L'Aurore de sieur Henri de Lintaut.